Until fairly recently the fungi were considered a primitive, even ‘Cinderella’, group of plants. The boundaries of the group did not seem to be entirely clear, with some seeming to possess characters of simple animals, such as amoebae. The fungi turn out to be a huge group of diverse organisms brought together by the fact that they do not manufacture their food by photosynthesis or ingest their food so being quite distinct from both plants and animals. Despite the past uncertainties we have nevertheless relied on them over millennia for many familiar foods, drinks and chemical products, including important pharmaceuticals. Fungi also underpin the process of nutrient cycling through rotting down plant and animal remains and making simple, easily used compounds available to other organisms. Over 85% of vascular plants are tied to associations with fungi, the latter assisting in scavenging essential nutrients, helping their host plants to overcome competitors, and even protecting them from disease organisms. In spite of the ubiquity and importance of fungi, however, they remain little known to many people, with their beneficial activities being poorly appreciated. But perhaps this is not surprising, considering they are a largely invisible group of organisms. The reality is that human cultures would not be the same. There are estimated to be around 1.5 million species of fungi in the world. This enormous diversity makes fungi one of the largest groups of organisms known, dwarfing our own group, the mammals, which numbers a mere 4,260 species. We probably know all but a few of the mammals, but surprisingly less than 10% of the fungi. This discrepancy in knowledge is easily explained: mammals, in addition to being less numerous, tend to be large and conspicuous; fungi, in contrast, are often hidden from view for all or part of their lives. There are estimated to be around 1.5 million species of fungi in the world. A major reason why fungi remain largely hidden is that by far the majority are microscopic. We only become aware of their presence when our food goes mouldy, or we stop to think of the countless everyday products that require fungi in some way. Even those fungi which do produce visible structures, such as mushrooms, toadstools and brackets, remain hidden from view for all or much of their lives. They are essentially oversized ‘microorganisms’, as their life cycles are the same as the microscopic species. The visible parts are usually the fruit bodies produced for reproductive purposes. In a few cases these can be of giant proportions. However, these are really exceptions, as in nearly all major ecosystems most fungi are to be found well out of human sight. Fungi occur in just about any environment you care to think of. They are to be found, for example, in the guts of insects, the stomachs of herbivores, inside tree buds and on the surface of roots, to name but a few. Anything from cracks in rocks to the few areas of open water in the Antarctic can provide suitable conditions. Fungi are found literally everywhere and are especially important in forming close relationships with other organisms such as plants and insects. There are in fact species of fungi that manage to fly by attaching to the legs and bodies of insects, and in special pouches in some beetles. In the latter case, the fungi then colonise the beetle’s wood-burrows, and the larvae feed on the fungus as it is able to obtain nutrients from the wood that the insect cannot get on its own. Similarly, various tropical termites and ants cultivate specific fungi in special gardens in their nests, utilising the fungus to break down the vegetable matter they collect. The fungus is then used to feed the developing larvae. 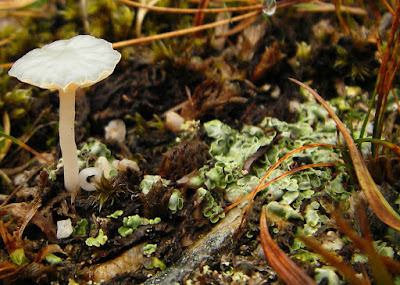 Many fungi are hidden from view within the soil although they are an important part of the soil ecosystem, providing food and shelter to soil-dwelling invertebrates. Some even turn the tables on animals and produce snares and sticky traps to catch soil microbes. Some fungi are parasitic attacking a wide range of organisms. On vascular plants they can produce spots or splodges on leaves and stems, and can even form red or yellow flower-like tongues on fruits and cones. White downy or powdery surfaces usually indicate the presence of their fruiting stages, while cereal heads and some flower parts may be reduced to powdery masses of spores (colloquially called bunts or smuts as they discolour the fingers when handled). More dramatic are the red, raw rings on human skin or that of animals caused by ringworm fungus. Other parasitic fungi have been implicated in the demise of many of the world’s amphibians, even immuno-suppressed hospital patients and more recently possibly in the demise of hibernating bats. Plants produced the early oxygen-rich atmosphere through photosynthesis and paved the way for the evolution of larger, more energy-demanding organisms. None of this would have been possible without the fungi which developed intimate, mutually beneficial associations with plant roots. These fungi are termed mycorrhizas and they fall into two main groups. The first group — arbuscular mycorrhizas — consists of microscopic species found within the cells of roots and connected to the surrounding soil by thin threads through which they scavenge for nutrients. Many of our staple foods — including cereals, and soft and stone fruits — have such associations. The other large group, most of which are mushrooms and toadstools is the ectomycorrhizas. These fungi form a sheath around the root of the tree, with only some fungal filaments venturing between the cells. Again, important nutrients flow between the partners, and the success of our dominant trees, both temperate and tropical, depends on these associations. One of the most successful fungal associations worldwide — found from sea level (even in the sea) to the highest peaks and from the cold deserts to the tropics — is the lichens. Once thought to be independent organisms in their own right they are in fact an intimate relationship between one or more algae (or cyanobacteria) and a fungus. Lichens form the familiar colourful blotches on rocks, gravestones and tree trunks. Indeed, lichens may have been the primary source of oxygen on Earth. Traditionally the fungi were divided into five major groups, based on the structure of their reproductive organs and whether sexual spores were formed or not. Following research over the last 25 years this approach has changed dramatically, resulting in a whole range of separately defined groupings. However, two major groups defined in the old texts are still prominent in the classification and encompass the fungi likely to be encountered by the field mycologist. The first group, which includes the familiar mushrooms, toadstools and brackets, is characterised by the reproductive process coming to fruition in the production of four and sometimes more spores on the apex of projections arising from a single cell termed a basdium (a spore is equivalent to a seed in a flowering plant). Hence these fungi are termed basidiomycetes and are exemplified by the cultivated mushroom. In some species, perhaps more distantly related, this cell is divided, either transversely or longitudinally. A good example of the former is the jelly fungus witches’ Butter and of the latter Judas’ ear fungus and the rust-fungi which can devastate cereal crops. The second group is sometimes referred to as the elf-cups and relatives, and have a rather different spore-bearing structure. The spores, generally numbering eight (though there may be multiples of this number), are produced in a sac. In some species the sac is thick-walled or resembles a ‘party popper’, ejecting the spores with great force after the inner wall has become deformed by pressure. The group is divided further through different shapes and structures of the sac. The ascomycetes, as these fungi are known, derive their name from this sac, or ascus. Included in this group are the truffles, morels, powdery mildews and elf-cups. Both these groups contain species which are known to have reduced their morphology to such an extent that they really only consist of egg-shaped cells. These are the yeasts, and they may be of ascomycete or basidiomycete ori9in. Thus even in a single group there can be enormous diversity of form. It is little wonder that the fungi have been so hard to understand. Many ascomycetes and basidiomycetes have lost the ability to produce their characteristic sexual structures, or do so rarely. Instead they produced many different kinds of asexual spores, varying in structure, colour and ornamentation. In the past the asexual fungi were classified together as the Fungi Imperfecti, but this grouping is now recognised as being quite artificial. Recent work has helped to clarify the relationships of several smaller groups that have very simplified external form and consist of little more than aggregations of filaments or cells, which at most form swellings full of spores. Despite their simple form, their chemistry and cell components are very diverse because during their evolution they have exploited so many different habitats. They are generally microscopic, but the common pin mould is an example of one that produces a visible structure. Some microscopic species are motile at some stage of their lives, and have small filaments which act as propellers. whilst others superficially similar are now known not to be fungi and are considered to be related to algae. They have lost the ability to make food using sunlight and now have a fungs-like lifestyle. Another group that were traditionally regarded as fungi, but are now known not to be, are the slime moulds. Reports of white or yellow mucus climbing over vegetation represent sightings of the mobile stage of slime moulds. when mature they dry out and produce masses of powdery spores which cling to objects Fungi that produce obvious fruiting bodies (mushrooms and toadstools) are primarily composed of filaments that grow in the soil or organic matter spreading over an ever widening area. These filaments are termed hyphae and when bunched together they form what is called a mycelium. The filaments are hard to see but the mycelia take on a distinct pattern - for example the dreaded and distinctive mycelia of the dry rot fungus growing over woodwork, plaster or brickwork as fans and membranes. Mycelia may exist for many years rarely giving away their presence, and the fungus may only become obvious when favourable conditions result in sexual or asexual reproduction The culmination of reproduction is the production of microscopic spores, which are then dispersed by wind or rain-splash, physical disturbance or insect or larger animal vectors — in their stomachs, on their feet or by simply hitching a lift on their bodies. When the spores find a suitable resource on which to germinate, the process starts again. Spores and hyphae can have a hard time in nature as they provide nutritious packets of food for microorganisms. The sexual structures of the more obvious species may not be found every year, even in areas which are being closely monitored. For some species it is not unusual for the time between seeing a fungus in a particular location to be up to 20 years or more. This makes recording fungi a rather difficult and possibly scientifically hazardous occupation. However, help is at hand. The introduction of molecular techniques called DNA fingerprinting make it possible to trace a fungus within wood or soil without having to have the tell-tale fruit body present. The individual molecular make-up of a fungal form can be checked against a library of molecular fingerprints, obtained from known species. In this way we are able to understand more what the fungi are doing whilst out of view and trace where they are hidden. Such techniques have shown that some species of the Honey Fungus can be as big as 900 hectares, with a weight approaching 150 metric tons. Some of these massive fungi are estimated to be around 2,400 years old! This contrasts dramatically with the few days lifespan of the fruit bodies. Fungi are an ancient group — the evidence suggests they may have been around for as long as 850 million years. The variation held in the genetic code (DNA) of living things can be used to estimate the time since two lineages diverged from a common ancestor. Traces of what mi qht be ~fungi can be recognised in rocks of most ages, but the most spectacular finds ha’te been in ambers 15—30 million years old. These show perfectly formed mushroom-like structures. So welcome to the wonderful world of fungi!